“Allosaurus Arrives on the Mall,” Histories of the National Mall, accessed April 22, 2019, http://mallhistory.org/items/show/492. 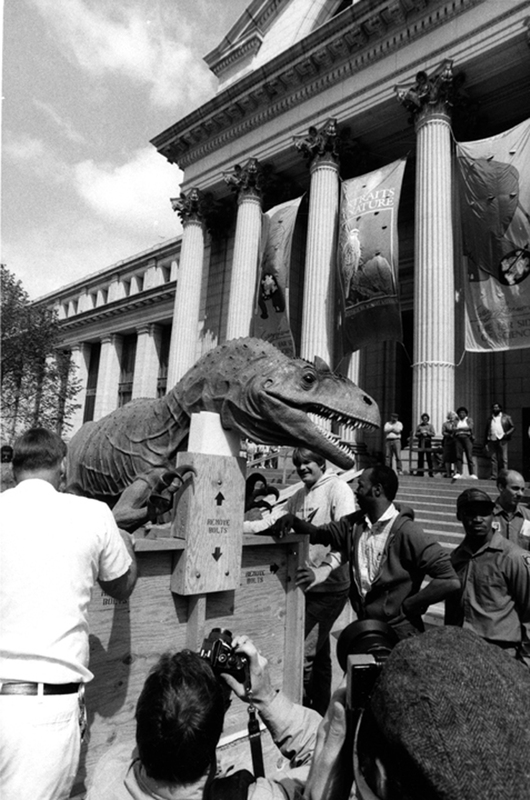 In April 1987 a one-ton fiberglass Allosaurus sculpture was moved into the National Museum of Natural History. A crowd formed on the Mall at the steps of the museum to watch the dinosaur lifted into the building with a winch. The 20-foot-long model was featured in the "Dinosaurs, Past and Present," a temporary exhibit displaying artistic representations of dinosaurs constructed in the 1800 and 1900s. After three months, the Allosaurus and other works traveled to museums across North America.